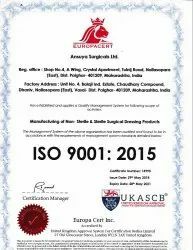 “Ansuya Surgical Ltd,” is an ISO 9001:2008 certified organization involved in Manufacturing, Exporting and Supplying an extensive range of Surgical Products. Our range includes Synthetic Casting Bandage, Soft Pad(Cast Padding), Net Cotton Stockinette, Elastic Adhesive Bandage, I.V. Cannula Fixator and Cotton Gamjee Roll. Further, we also offer Chlorhexidine Gauze Dressing B.P., Paraffin Gauze Dressing B.P., Abdominal Pad B.P and Combine Dressing. Our clients can avail these under the brand name of Clinisafe, Bactisafe and “Innova”. Our team puts in all their hard work to meet the requirements of Medical Colleges, Beauty Saloons and Hospitals. Being a quality conscious organization, we perform stringent checks at every stage of the production procedure. To ensure our range of Surgical Products complies with international quality standards, our team of quality controllers check the end products for hygiene levels, adherence properties and sterilization. Further, we manufacture our products with basic material procured from reliable vendors . Our manufacturing facility is fully equipped with requisite machinery to deliver a flawless range of sterilized and hygienically processed Surgical Products. Adherence to timely deliveries and consistency in product quality has earned us a huge clientele in countries like UAE, Zambia, Yemen, Malaysia, Indonesia, Kenya and Africa. In order to attain maximum client satisfaction, we provide a sampling policy at nominal rates. We have achieved this level of success under the able guidance and support of our chairman, Mr. Mahabir Prasad Sharma. His insistent efforts have encouraged the workforce to boost up the domestic and international sales and become a stand alone leader of quality and excellence in the domain. Manufacturing and Trading of an extensive range of Surgical Products. We have emerged as a leading manufacturer and exporter of a comprehensive range of Surgical Products. Our range includes Soft Pad (Cast Padding), Net Cotton Stockinette, Elastic Adhesive Bandage, I.V. Cannula Fixator and Cotton Gamjee Roll. Further, we also offer Chlorhexidine Gauze Dressing B.P., Paraffin Gauze Dressing B.P., Abdominal Pad B.P and Combine Dressing. We offer these under the brand name of “Innova”. Being a successful organization, we endeavor to offer Surgical Products and meet the growing demands of the market around the globe. To fulfill the same fact, we have employed a team of dexterous professionals, who provide us constant assistance in preserving the quality standards. All the professionals are hired only after stringently checking their domain knowledge. All these experts work in close synchronization to meet client’s requirements within the stipulated time frame. We further conduct regular training sessions to enhance their skill-set and keep them abreast with the latest technological advancements.